This is about the first book of the warriors series into the wild! If you have not been able to read them lately please do so and then come back to finish the quiz! What is the prophecy at the beginning of the book? Who does Rusty first meet in the forest? Who first taunts rusty because he is a kittypet? who is graypaw's first mentor? 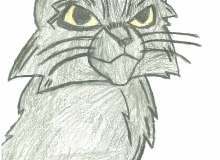 Who is the first medicine cat of Thunderclan in into the wild? Who are the first 4 leaders of the clans in into the wild? Who does firepaw attack on his first solo mission? what does Tigerclaw accuse Ravenpaw of doing? Where do Firepaw and graypaw take ravenpaw? What is Firepaw's warrior name? how many lives does Bluestar have at the end of the book?